During the span of two weeks, my stay in Hyderabad has given me greater insight on the dynamic nature of cities. While working closely with the staff members of Hyderabad Urban Labs (HUL), I have discovered the many layers that form the overarching image that we see in cities. Examining issues, such as waste management and uses of public space, has allowed me to see how various interactions contribute to the functioning of the city. In our first group discussion in Hyderabad, we analyzed cities in relation to ecosystems. The flow of matter and nutrients in ecosystems parallels to what happens in cities. Despite the chaotic atmosphere in cities, the interconnectivity keeps the city running. Multiple components interact together as a part of the city flow. However, there is an underground working force, whose contribution to the city flow is often unseen by the public. One would not usually think about how local scrap collectors shape the city. 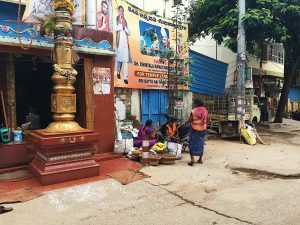 But the labor of those in India’s informal economy has a huge impact on the city’s functioning despite the lack of appreciation from the public. According to an article in Forbes, 76% of people in India were working in the informal economy from 2000 to 2010. Even though the bulk of India’s workforce is part of the informal sector, there has been a strong push to reduce this percentage as the informal sector becomes increasingly viewed as stunting the growth of India’s economy. Yet, diminishing the informal economy not only has implications for those working in the sector but also for the entire functioning of the community, whether it be urban or rural areas. A prime example of this can be seen with the case of waste pickers in many Indian cities. In regards to waste management, India’s wealthy has voiced their desire for more privatization in the collection of municipal solid waste. This trend has impaired those working in the informal recycling sector, leaving many jobless. 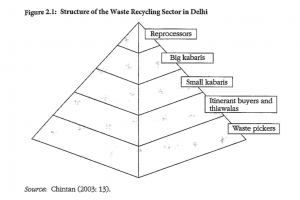 Within the informal recycling sector, there is a structured hierarchy. On the bottom are the waste pickers, who gather garbage from bins on the streets and nearby landfills. Climbing up the ladder, there are traders, scrap shop owners and reprocessors. But all levels of the informal recycling sector are suffering from privatization. 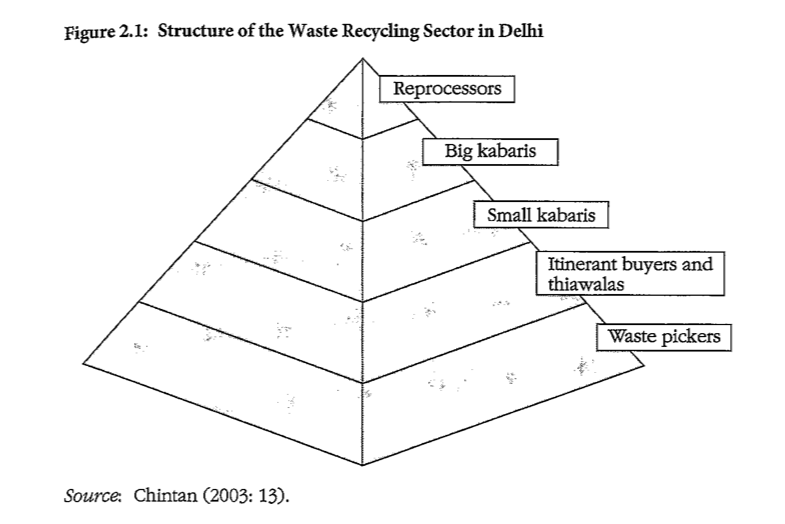 A demonstration of the non-formal recycling sector in the form of a pyramid. This demonstration was provided by the book, Urban Navigations: Politics, Space and the City in South Asia. Waste pickers have a stigma of being nuisances, but in reality, these laborers provide better segregation of municipal solid waste than private companies. Scrap shop owners earn more money when waste is segregated into finer categories, and those who segregate waste are experts, especially through their years of experience dealing with waste. Throughout my trip in India, I have seen several people picking in trash bins, and I now know the significant role they play in communities. During my stay in Hyderabad, I have also paid more attention to the sweepers in the city. Women, who are identified by their neon orange vests, are commonly seen sweeping all the debris from the streets. A typical day in the life of a sweeper includes hours of scrubbing paan stains, removing dead animals and picking up thrown litter. 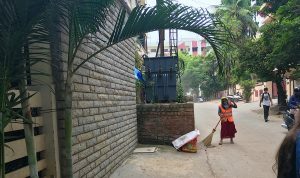 Despite the efforts made by these sweepers to give everyone in their community a clean environment, many have reported that they are rarely thanked for their work. But the lack of gratitude and acknowledgment of these waste pickers and sweepers stems from the ingrained social structures in society. 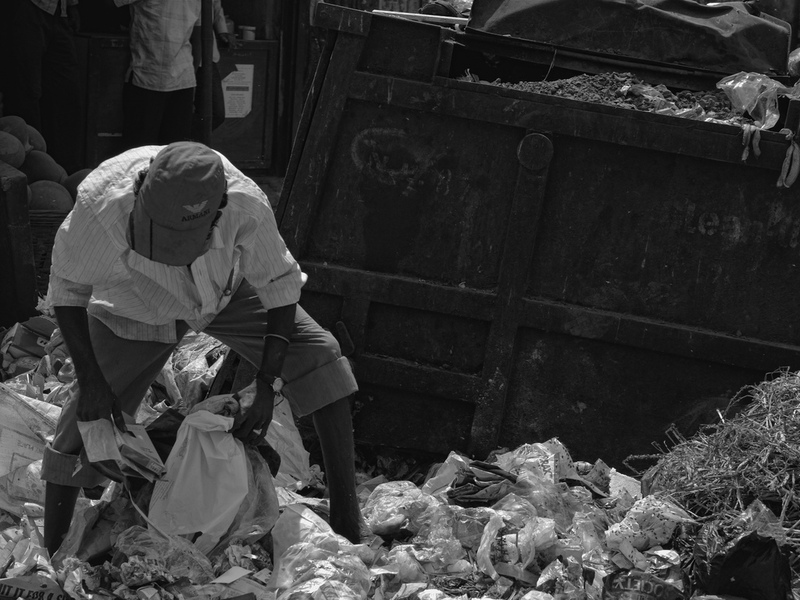 In general, waste pickers come from low-income, low-caste backgrounds, and waste has now become a status symbol. The intrusion of private companies into the waste collection business has produced a social justice problem. With private companies reducing the number of workers needed, there is an uneven distribution of profit made by trash collectors. A female sweeper in the streets of Anand Nagar Colony in Hyderabad, India. Photo by Hannah Metwally. A group of female sweepers cleaning near a Hindu temple in Hyderabad, India. Photo by Hannah Metwally. While we were in Hyderabad, a few of the HUL staff members presented their recent projects. A Place for Her was one of the projects that really stood out to me and focuses its research on the marginalized in the city. The pronoun Her does not only refer to women in the city but also the elderly, children and the LGBTQ community. One aspect of the project deals with women in the workforce, including the sweepers. The majority of the sweepers that I’ve seen do not have adequate work clothes. These sweepers were just recently given the neon vests to prevent them from getting run over. But other than that, the women do not have proper footwear, usually wearing sandals, and do not wear gloves or facemask. Since sweepers are in the informal economy, they have no government support or protection. Thus, the “invisible” people that shape the city need more recognition because if the informal sector workers are removed from the system, disruption of the city flow will occur. A Place for Her is an amazing start in providing more research and a database for analyzing the informal sector and the hidden figures who contribute to the city flow. This research can be used by organizations in justifying their cause, and used by activists to persuade government officials. There needs to be an overall change in people’s perspectives on the informal economy workers. Instead of viewing these workers as troubled street rats, we need to see them as contributors to the city flow. 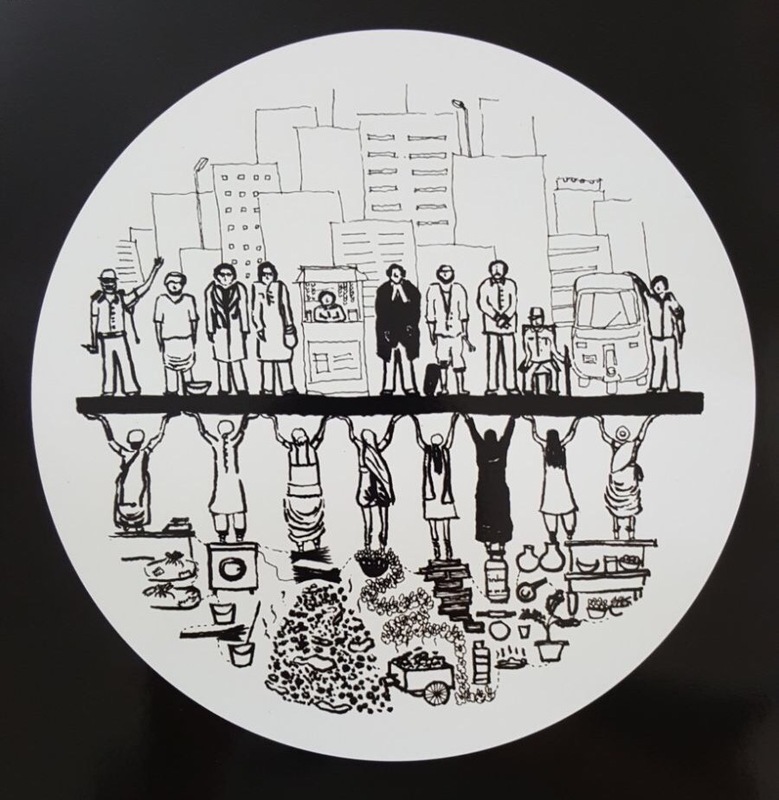 A powerful illustration drawn by Neha Vaddadi, an HUL staff member, showing the underground workforce in the city. Gidwani, V., & Chaturvedi, B. (2011). Poverty as Geography: Motility, Stoppage and Circuits of Waste in Delhi. In Anjaria, J., & McFarlane, C., Urban Navigations: Politics, Space and the City in South Asia (50- 77). India: Routledge.